The Guide on how to use PIR security to add additional security to your motorcycle garage or shed. Security experts always talk about layers of security. 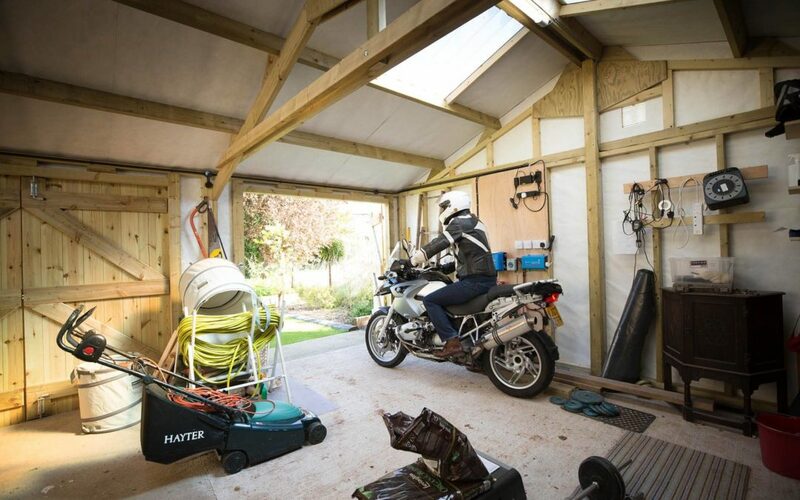 If you have a garage or shed to keep your motorcycle in, nice one, it’s one of the best layers of security you can have. The bike is out of sight and behind a layer of security. Thieves would much rather pinch a bike off the street, than risk being caught breaking into a garage. That said, as good as your garage and shed are at preventing motorcycle theft, a garage is not Fort Knox. 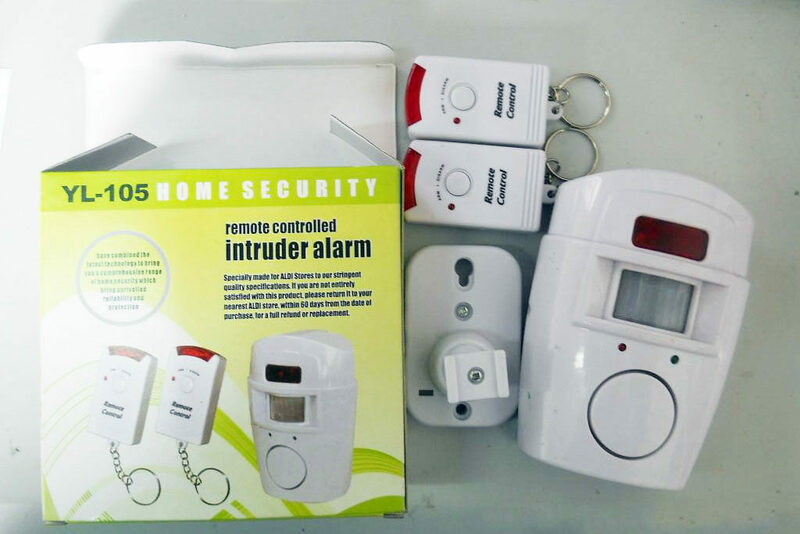 Thanks to the progress of technology and the Chinese industrial might, a battery powered garage alarm costs just a few quid – five years ago hardly any were on the market and the ones that were cost around £100 and had to be wired in to the mains. 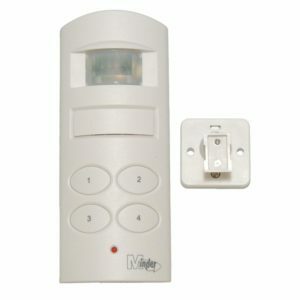 The beauty of a battery powered PIR alarm is that it’s a lot easier to setup than wired system. You can order one online and have it setup in your shed the next day. PIR stands for Passive Infrared and that is the sensor that detects infrared heat (body heat). Connect up a battery and an alarm and hey presto, you’ve got a simple burglar alarm. PIRs are at their best when deployed in a closed area (i.e. shed or garage) as this will limit the number of false alarms they generate. Outdoor PIRs are generally more complex and therefore more expensive, in order to not get triggered when a small animal or passing vehicle enters their range. A PIR featured a charge-coupled device (CCD) and a lense which delects ‘hot’ and ‘cold’ patterns. As soon as enough ‘hot’ pattern has been detected the system triggers an alarm. PIRs can cost as little as £10 and in this guide, they cost over £100 but the complexity of the PIR and supplied fixtures and fittings are behind the differences in price. A more complex, more expensive PIR will have higher-quality components and circuitry that can better detect a true event, also known as a pulse in the PIR industry. A high-end PIR will calculate the size of the object, the speed of movement and the temperature difference. A basic PIR might trigger as soon as it detects a single or perhaps double pulse – known as a double-knock. A PIR that triggers with a single pulse (or knock) will be prone to so many false alarms, it’ll be in the bin before the morning. A PIR garage alarm can range from a few pounds to hundreds of pounds. They can be grouped into a few categories. These are the most commonly used. Usually mounted at the join between two walls, above 2-metres high, they have a detection range of around 10 to 15 metres at an angle 90-degrees to the PIR. The vast majority of shed alarms are standard PIRs. Exactly as above, expect for the sensor is split into four zones (two by two). Each zone points at a slightly different angle, so that 4 readings are always being taken. The system then looks at the hot-cold pulses to better determine whether the activity is a false alarm or true alarm. Some of the more expensive shed and garage alarms feature quad PIRs. These are usually quad-zone PIRs with reduced sensitivity at lower detection levels. Pets give off less heat than humans and so avoid triggering the sensor. Some pet-friendly PIRs also have specific instructions for the height they are set at and the angle of the sensor, effectively excluding the floor from being detected. Usually not a consideration for a garage or shed alarm. These are designed to prevent tampering. If a thief had access to your PIR when it was unarmed (in a motorcycle dealership, for example) and put tape across the sensor to block the infrared from reaching the CCD, an anti-masking PIR would detect this when armed and sound the alarm. Some PIRs like this one feature the ability to add a SIM card and the PIR will send you a text or call you when it is activated. These are super-useful if your motorbike is secured in a garage or shed away from your house. You can even setup this PIR so that the alarm doesn’t sound – it just sends you a text message. So you could setup one with an alarm (that risks getting destroyed) and one that doesn’t make a sound but does send you an alert. The intruder might have a go at smashing the alarm but the other PIR will have alerted you. If the thief thinks they have disabled the alarm and sticks around, they’ll be in for a shock when you – or the police – turn up. When talking about bikes and security, it’s a bit of a gloomy topic. Thieves appear to operate with impunity and appear better equipped to steal bikes now, than ever. But there is a great story I want to share. A friend of mine lives in a smart area and has a nice house with a detached double garage. There had been a couple of burglaries nearby where lawnmowers and other gardening equipment had been pinched. He was wary of the three bikes in his garage being a target, despite them being chained up to a couple of ground anchors, he pulled this crafty little trick out of the bag. He fitted this wireless doorbell next to the garage door and labelled it ‘Press to open’. He sat the wireless chime on his bedside table. For weeks nothing happened but then one evening, he recounts, he heard a doorbell around at around 1am. He was in the kitchen with a friend, getting through a bottle of wine and thought to himself ‘what’s that doorbell noise?’ and then it dawned on him. It was his wireless doorbell, which meant someone outside had just pressed it. He legged it to the front door only to see a figure dashing across his drive, across the front lawn and vaulting the fence. The (suspected) burglar had seen the blue button on the side of the garage door and thought his luck was in – pressed the button hoping for the garage door to open – not realising he’d just given himself away. It’s by no means a fool-proof idea (you have to be in the house to hear it and able to react quickly) but you have to give credit to the ingeniousness of it all. If you have a shed at the bottom of the garden, you could use a wireless doorbell with a label along the lines of ‘Alarm Cut Off’ or similar and you might get lucky if a scummy thief is thick, lazy or best of all, both. Just £10 buys you a garage PIR alarm and it’ll sit there quietly until you really need it, when it’ll unleash a deafening 100+dB siren, alerting you to the fact someone’s trying to pinch your motorbike and ensuring the scumbag thief isn’t given the chance to operate in silence. We’ve picked the best PIRs with a range of criteria. From the budget option, to PIRs with a keypad and no fobs, to the loudest garage PIR alarm or a PIR from a household name. We’re confident that one of the PIRs below will help you secure your motorbike in your garage or shed. Be alerted of any intruders by this motion sensing alarm. Place the alarm wherever you need, on a wall with the adjustable mount, or placed on a shelf or table. (Not fully weatherproof). The 100dB alarm can be powered by 4 x AA batteries (not included), or by 6V DC power adapter (not included), the remotes are powered by 3 x AG13 button cell batteries each (included). 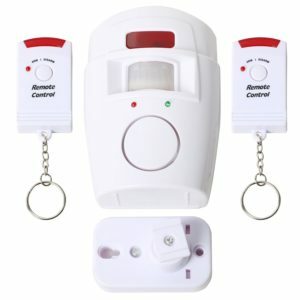 The alarm comes with two keyring remotes which can arm and disarm the alarm the push of a button. Powerful 128 dB alarm sound with User programmable codes. Exit Delay 30 seconds, Entry Delay 10 seconds with Auto rest alarm to avoid false trigger. No wiring – installation in seconds, Battery – 4 x AA alkaline (optional) with Low Battery Indicator. Detection Area 6m long, 60 degrees horizontal, 20 degrees vertical with External siren socket. Rotary bracket also included – Wall mounted or free standing. The tiiwee A2 Motion Sensor Alarm is a perfect all-in-one solution for many applications including securing your motorcycle in your garage. It can be used as an alarm system for your home too. You’ll hear a loud 125 dB alarm siren or a loud chime if the motion detector detects movements. 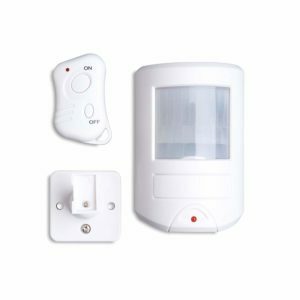 The Defender PIR alarm is a high quality motion sensor alarm that is suitable for use in homes, offices, outhouses, sheds and garages. Easily armed and disarmed using a Radio Frequency key fob, the alarm houses a powerful 130dBs siren. If any movement is detected it will release a warning beep to allow you to disarm. If further movement is detected and the unit has not been disarmed it will trigger the alarm. 30 second entry/exit delay, wall mounting bracket included. No matter how well your property is secured with locks, fitting an alarm system will add peace of mind and an additional level of protection to your home. Many people are put off by the high cost of some alarm systems, and the mess associated with installation. 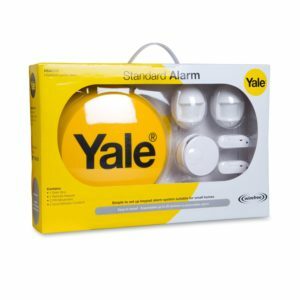 Yale, the brand leader in home security has introduced this cost-effective home security alarm, which offers a complete alarm solution for your home, and external buildings such as garages and sheds. The Standard Alarm is a basic keypad operated system ideal for a flat, terraced, or semi-detached home. The keypad enables you to set or unset the alarm via an access code. The system is pre-set with a 20 second exit/entry period and will allow the entire property to be either armed or disarmed. A PIR on its own is not enough. If you have a garage or shed, think about using a ground anchor and good chain and back this up with an alarm disc lock. A PIR alarm and a ‘silent’ GSM alarm is a good cheap combo. An alkaline battery – although less environmentally friendly – will last longer than a rechargeable battery. Where is the best place to mount a PIR? Most PIRs have a blind spot, so it’s best not to mount them over a door or they won’t trigger until the intruder is well inside the room. It’s best to mount a PIR in the corner of a room or your shed, facing the obvious entryway; a door or window. What is the range of a PIR? All PIRs in this guide have a range of at least 10 metres – ideal for most garages and sheds. What’s better, a wireless or wired PIR? This totally depends on where your garage or shed is located. The benefit of a wired PIR is that the PIR and the alarm are in separate locations, so if the PIR sets off the alarm and the intruder smashes the PIR to pieces, the alarm will still sound. For most wireless (battery powered) PIRs, the alarm and PIR are one unit and so are at more risk of being disabled. However, just the sound of an alarm is enough to disrupt any attempted theft and throw another hurdle at an intruder. What’s the best PIR for a lock-up garage? If your garage is located away from your home, i.e. a lock-up garage, then a PIR with a built-in GSM SIM is a great option. 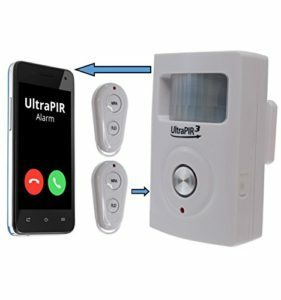 The PIR will activate the alarm if an intruder is detected but the system will also send you a text or call you – allowing you to get on the scene. How long do the batteries in a PIR last? Most PIRs use three 1.5v AA batteries and these should last around 12 months. Should I use rechargeable batteries in my PIR? PIRs are low-draw devices and as such a good quality alkaline battery (think Duracell) will do the job well. The trouble with a rechargeable battery is that they lose their power quicker than an alkaline equivalent. If money isn’t an issue, buy a couple of sets of rechargeable batteries and swap them over when they run low – job done.